LAFAYETTE, LA- The Riveters Theatre Troupe is best known for their production of HAIR in September of 2013, and more recently for the first theatre award ceremony in Acadiana, The Rosies. 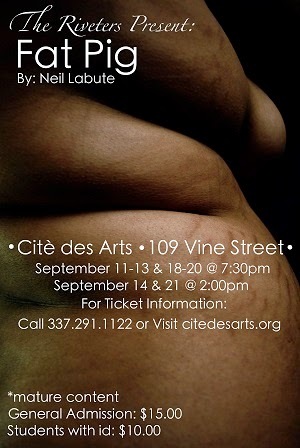 On September 11, 2014, The Riveters will present Fat Pig by Neil Labute, opening at Cite des Arts in Lafayette, Louisiana. Neil Labute has written other very popular shows such as The Shape of Things, Reasons to be Pretty, and Some Girls. In this dramatic piece, you follow Tom on his journey of self acceptance and finding out who he truly is as a human being. He meets a beautiful, voluptuous woman named Helen on his journey and that’s when the bumps in the road hit hard. His co-workers, Carter and Jeannie, do not accept Helen. Why you ask? Because she does not look like they think she should. They do not base their opinions on her personality, they base it on what society tells them is right. Does Tom do the right thing? No one truly knows what is right and what is wrong. The Riveters Director/ Co-Founder, Martin Smith, will direct this production. The ensemble cast consists of seasoned theatre veterans Michael Cato, Amanda Lyon, and Deserea Noriega and is the debut performance for Chase Huval. Our design crew, which also consists of very experienced artists, includes Jenna Fontenot, Gina Baronne, and Sarah Hitchcock Langley, with Logan Hensgens as the stage manager. For more information visit www.citedesarts.org or call 337-291-1122. Also visit riveterstheatre.weebly.com to keep up with our future productions.